The FTSE 100’s recent record breaking run showed no sign of ending as the UK’s main share index hit another record intra-day high. In morning trade, the index climbed to 42 points, or 0.5% to 7,495.68 – meaning it is up 5% this year. Vodafone led the way, with the mobile giant’s shares rising 4.1% as investors ignored news of a hefty annual loss and focused on its upbeat outlook. It expects profits to grow due to good revenues from contract customers. Shares in easyJet fell more 5.2% after the airline reported larger-than-expected half-year losses. The airline recorded a loss of £212m in the six months to March, partly due to the impact of the lower pound and the timing of Easter. On the foreign exchanges, the pound lost ground after the release of the latest UK inflation figures. The inflation rate rose to 2.7% in April from 2.3% the month before. 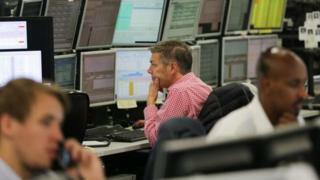 However, the pound – which had risen to $1.2958 at one point – slid back to $1.2909. Against the euro, the pound was down 0.5% at 1.1690 euros.